If you had a perfectly spherical or square stone, calculating the volume would be as easy as measuring its dimensions and crunching a few numbers. Unfortunately, stones are not usually a perfect shape, which means any formula calculation will be an estimate at best. However, you can use water displacement as a means of calculating the exact volume of a stone. This is done by submerging the stone in water and watching how high the water level rises. Fill a large, measured beaker half-full of water. Record the current volume of water by reading the measurements on the side of the beaker. Insert the stone carefully into the water. Make sure you do not splash any water out nor have the water overflow from the top. If it does, you will need to start over with a lesser volume of water in the beaker. Make certain the water completely covers the stone. If it doesn't, you will have to start over with a greater volume of water. Record the new volume by reading the measurement at the water level. Subtract the first volume from the second volume to calculate the stone's volume. As an example, if you recorded 10 cubic inches the first time, and 15 cubic inches the second time, then the stone's volume is 5 cubic inches. Taylor, C.. "How to Calculate the Volume of a Stone." 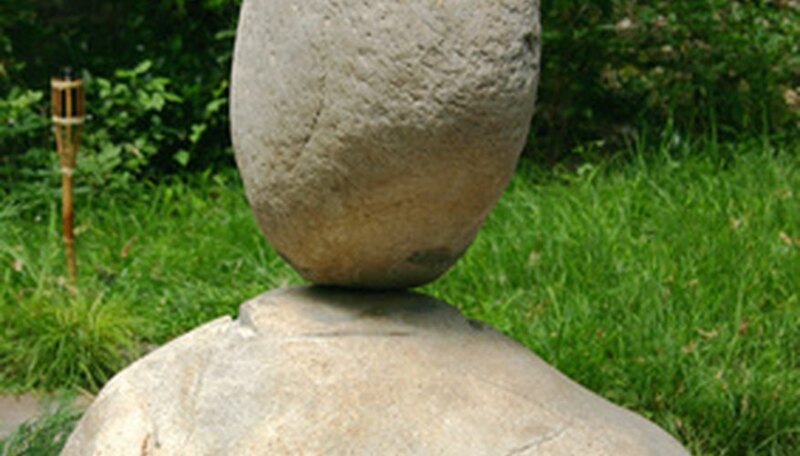 Sciencing, https://sciencing.com/calculate-volume-stone-7805263.html. 24 April 2017.